Fast - energy saving - hygienic with HEPA filter! A strong concentrated stream of air flows simultaneously over the water at a breathtaking 540 km/h on both sides of your hands. Your hands are dry in 10 seconds! The brushless motor provides a running time up to 3000 h or approx. 1 Mio. uses. Four infrared sensors activate the no-touch hand dryer – hygienic, easy and simple operation even for persons with a handicap or children. 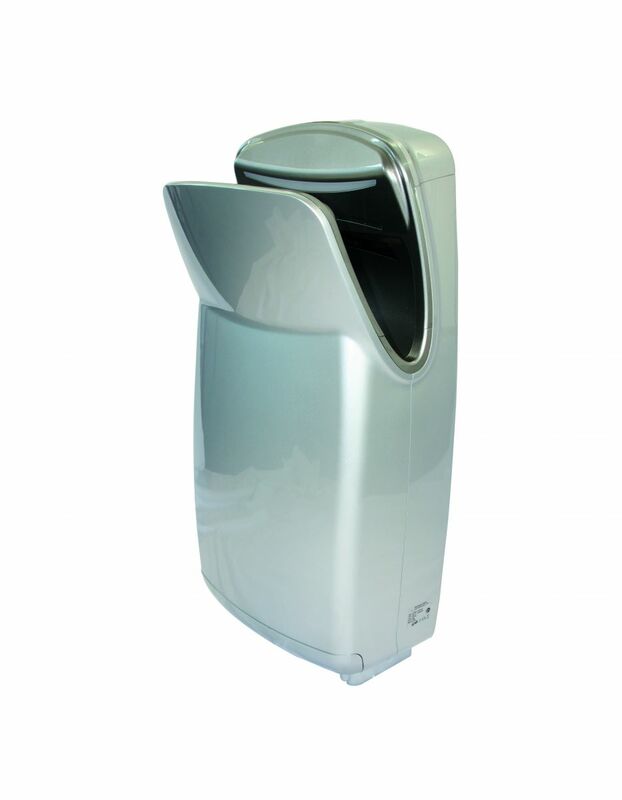 The water removed from your hands is collected in a lockable water tank that can be easily emptied. The electronic display indicate when the water collector has been emptied or the HEPA filter has to be changed. For noise reduction, the engine speed can be throttled by a switch from 1000 to 700 watts. For highly frequented areas or polluted room air: the additional MESH filter for protecting the motor and HEPA filter. The appliance is international HACCP certified. Find more informationen on the topic "Hygiene and hand dryers" here!